There are many entries signals to look for before entering a trade. The ones we will focus on for entries will be M & W reversals, The Straightway Trade, The Homerun, 5/13 EMA ChrisCross, Pins and Spikes, Half Batman, Divergence, Stop Hunt, NY Reversal. All of them would more or less also be the exits just at the opposite side. This is probably the most difficult of all of the signals to spot. Trap moves (consolidation) almost always happen the day prior leading up to major news events such as NFP, sometimes two days before. Once consolidation ends the real trend begins and will more than likely occur without a stop hunt. The stop hunt is where you would usually identify the strike zone and entry points. Key things to look for are for this to happen after Level 1 consolidation, in line with technicals and a pull back to or just passed the 50 EMA. This is the more likely setup to occur and is a lot easier to spot. The M or W formation will occur after price moves out of the Asian range and/or after three pushes on M15 which will lead to the formation occurring with the second leg forming 30-90 minutes after the first. The second leg will be less extreme than the first leg and could happen in a RRT(railroad track) or longer than 90 minutes. Alternatives to the information listed above could be a more narrow or wider Asian range (normal is 25-50 pips), more or less pushes out of the Asian range oppose to three pushes, a RRT with a small candle in between and HOD/LOD not being created in the London Session but in the Asian or US sessions. The Homerun is simply when the market pulled back to the 200 EMA and did not break it. On a setup up like this, you will see a reversal back to the 200 EMA and price will fail to break the 200 EMA on M15, once this occurs the trend will again reverse and bounce off the 200 to create a new direction. The 200 EMA is the home base. The 5/13 Ema ChrisCross will occur on M15. Since these are signal lines, when they cross most times it will signify an entry/exit signal. In the correct context and part of the chart, the five crossing below the 13 means a sell and the five crossing above the 13 signifies a buy. Spike candles will occur near the HOD/LOD on M15. These candles are designed to get the trader excited and start trading with emotions instead of knowledge, pressuring you to enter the market. Price most often pulls back before the candle closes which makes the ones who entered from excitement trapped in a draw down. These candles are often the first leg of the M or W formation and price always pulls away very quickly. Other variations are spinning tops, hammers, inverted hammers, doji's, evening and morning stars and RRT. The half Batman can also be looked at as the half M or W. It essentially is an M or W formation that didn't make the second move (or leg) and collapsed or spiked after the half Batman was created. The second swipe did not occur when there were enough traders trapped in in the first move and don't want to give them an opportunity to escape. Divergence, as seen in the indicator lesson, will be when the market price is bullish, and your MACD, Momentum or other indicator have gone bearish (or vice versa). This will signal you to start keeping a close eye on the pair and to start searching for major S&R levels where the price can turn around and join the direction of your indicator. A stop hunt will often time occur after the Asian range. The Asian range is between 25-50 pips and once it breaks you may see the three candle pushes to the top of the bottom (can occur in more candles) which will take out everyone's stops, clear the board and then reverse in the direction of the real trend. Traders have their stops 25-50 pips from the Asian range, so the first push takes out the 25 pip stops, the same move will entice traders to take positions against their original one that got stopped out. The second push will go another 20 or so pips taking out more stops, and the third movement is usually 5-7 pips. Different variations can also occur, somewhere between 1-4am EST they will make the stop hunt, and there can be a pause or pullback during the three pushes. They will widen the spread which triggers orders outside of the normal boundaries which makes people hold negative positions right from the get go. They take out stop, encourage traders to take positions which are opposite to the direction they will move the market, this will create the HOD/LOD. Once the HOD/LOD has been set they widen the spread like we said before and held the price for about 30-90 minutes. Once they have accumulated enough positions, there will be a second move to the HOD/LOD, but most times it will fail to take out the first move. This forms the M or W pattern or even the RRT. This is the best point to enter a position. The New York Reversal occurs between 8 and 11 am EST, but there may be different variations. The reversal will often create the HOD/LOD if the opposite side was made in the London session. If the HOD was set in the London session, you could look for the NY Reversal to set the LOD during the US session between those hours. If price holds between the HOD/LOD, you can see the price to do a 50-100% retracement to the level that was set in the London session. Below is a video attached to show examples of everything taught in this lesson. Lets not make this more complicated than it is. Short, sweet and to the point is the way education should be taught. Below you will see imagine’s on how to place a trailing stop on pending/live trade’s. 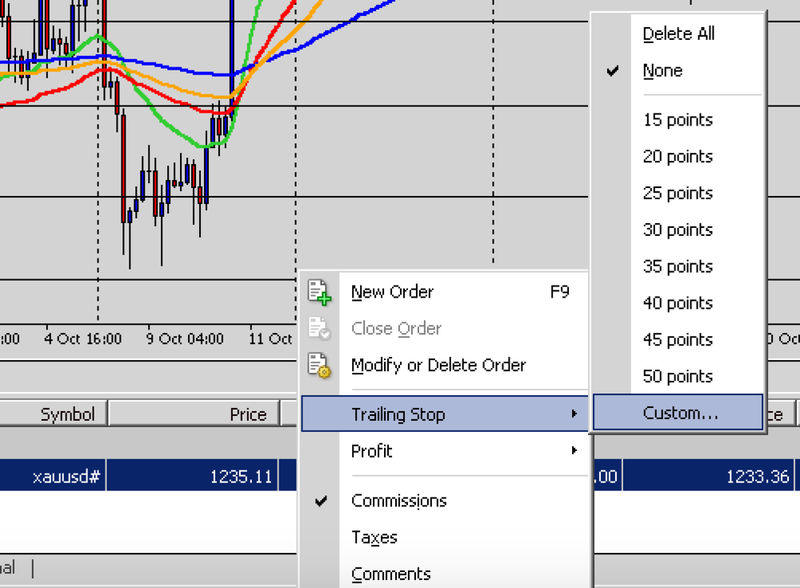 Drag your mouse over Trailing Stop and over Custom, now please left click on custom. After left clicking Ok on the last pop up you will now see this screen. After your pending trade is opened and the market moves 1point in either direction your Trailing Stop will be applied and under S/L will be Yellow and have a price. Please not that your account needs to stay constantly connected for this to work!!! If you close your computer or the account goes “Offline” your trailing stop will shut off because your Broker’s Server needs to constantly see your Trailing Stop settings to keep it going. You can either trade the “sleep” settings on your computer to allow it to stay on permanently until you say otherwise which should keep your account constantly online and connected or you can get a VPS. VPS (Virtual Private Server) hosting allows Forex traders to run automated algorithmic strategies, including expert advisors 24 hours a day 5 days a week on a Virtual Machine. A Trailing Stop works the same as an EA(expert advisor) so it needs your account to be constantly connected to continue to function.